The Eagle Stone possibly a corruption of the Norse god Aigle, who had a reputation for throwing large rocks around, is said to turn or move on certain days of the year. 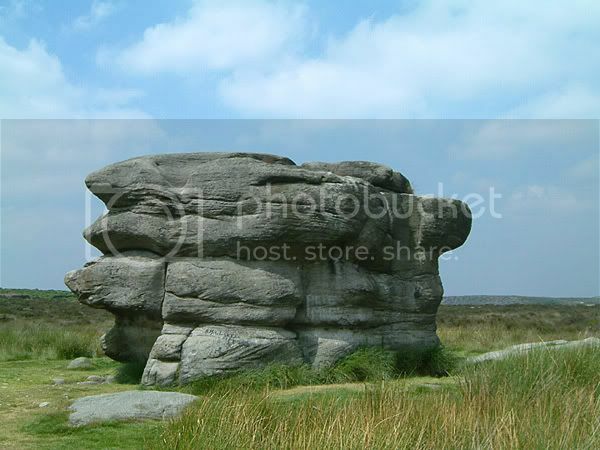 It is also the site of where, in times past, the young men of Baslow would prove their worth, to the women of the village, by climbing the stone (there is a relatively easy way up if you explore the rock). There is a much damaged ring cairn within 40m of the Eagle Stone but so covered in heather and crossed by hollow ways it isn't really worth the effort of looking for. Also, and again with no surface reamains, a flat cemetery containing inverted cremation jars dating to the Bronze Age has also been excavated in the vicinity of the stone. The northern termination of the enclosure of Gardom's Edge has been suggested to be aligned to the outcropping Eagle Stone. Parking in the pay and display car park at Curbar Gap, SK264 746, a well used path goes to the Eagle Stone along Baslow Edge.